Bank BRI is the Indonesian state-owned bank with the largest network. At December 2010, the Bank operated 7,004 branch networks all over Indonesia, consist of 18 regional offices, 14 regional audit offices, 413 branch offices, 470 sub branch offices, 822 cash offices, 4,649 unit offices, and 617 teras offieces. BRI also supported by 6,086 ATMs, which are integrated with more than 25,000 ATM networks (Link, ATM Bersama, and Prima). The Company established since 1895 and focused in Micro, Small to Medium size Enterprises financing. The Company’s head quarter located in Jakarta and served 33 million accounts either depositors or borrowers. In 2009, the Company obtained an award from Majalah Investor Award 2009 as the Best Bank. 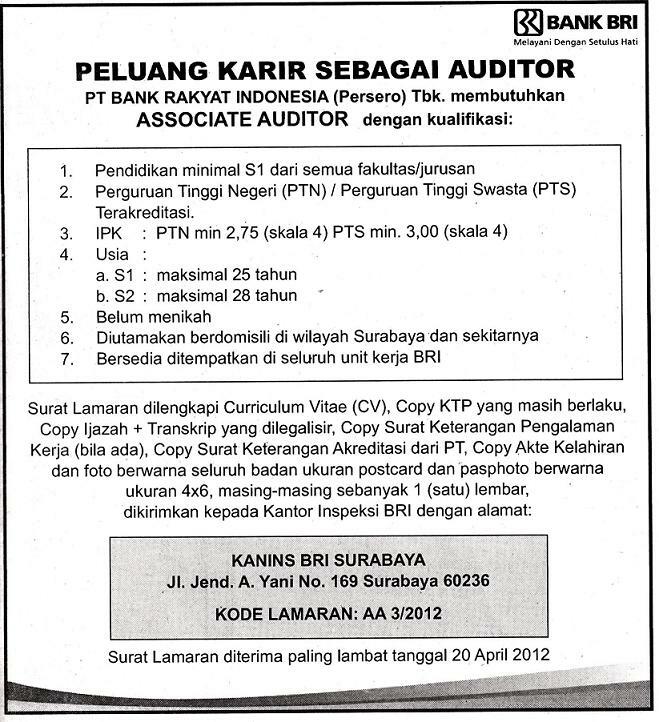 Closing date 21 April 2012. Only short-listed candidates will be notified.